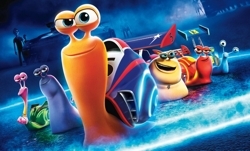 DreamWorks' Turbo is coming to Netflix in 2014. Forget Saturday morning cartoons. The most anticipated new animated shows for your kids aren’t going to be broadcast on network television; they’re airing online instead. DreamWorks, the animation studio behind the hit films Shrek and Madagascar, announced today that it is creating over 300 hours worth of original programming for Netflix based on its existing and upcoming movie franchises. According to Netflix, the new shows will “be inspired by characters from DreamWorks Animation’s hit franchises and upcoming feature films.” The first of these original series, Turbo F.A.S.T., will debut in December 2013. That series will be based on the company’s 3D computer-animated movie Turbo, slated to hit theaters this July. More animated series will be coming in 2014. So far, both Netflix and DreamWorks are playing coy as to which of your kids’ favorite movies will become online series, but the companies have a lot of intellectual property to choose from. DreamWorks is the company behind Kung Fu Panda, How to Train Your Dragon and Rise of the Guardians. DreamWorks will also be bringing a number of its movies to Netflix next year, starting with The Croods. Upcoming films Turbo and Mr. Peabody and Sherman will also be hosted on the site following their release in theaters. Netflix isn’t the only company developing original childrens’ programming for the web. Earlier this year, Amazon asked the Internet to help choose which of its 14 original series pilots deserved a full first season. Of the five series picked up, three are for children: Annebots, Creative Galaxy, and Tumbleaf.